The Federal Aviation Administration (FAA) announced this week that seven aerial photo and video production companies have asked for regulatory exemptions that would allow the film and television industry to use unmanned aircraft systems (UAS) with FAA approval for the first time. If the exemption requests are granted, tangible economic benefits could result as the agency begins to address the demand for commercial UAS operations. However, the associated safety issues must be carefully considered to make sure any hazards are appropriately mitigated, according to the agency, while petitioners must still obtain operational approval from the FAA. 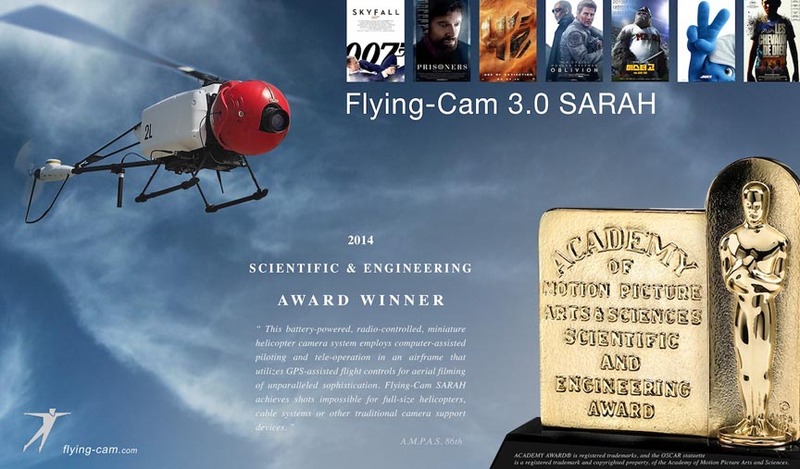 One of the applicant companies, Flying-Cam Inc., a Belgian company with USA headquarters in Santa Monica, California, received an Oscar from the Academy of Motion Picture Arts & Sciences (AMPAS) earlier this year — a Scientific & Engineering Award for the Flying-Cam 3.0 SARAH Unmanned Aircraft System, a GPS-guided UAV with onboard cameras. The Motion Picture Association of America (MPAA) facilitated the exemption requests on behalf of their membership. The companies that filed the petitions are all independent aerial cinematography professionals who collectively developed the exemption requests as a requirement to satisfy the safety and public interest concerns of the FAA, MPAA, and the public at large. In addition to Flying-Cam, applicants are RC Pro Productions Consulting LLC dba Vortex Aerial, Aerial MOB LLC, Astraeus Aeria, HeliVideo Productions LLC, Pictorvision Inc., and Snaproll Media LLC. The FAA has been working for several months to implement the provisions of Section 333 of the FAA Modernization and Reform Act of 2012 and move forward with UAS integration into the National Airspace System (NAS) before proposing a small UAS rule. Companies from three industries in addition to film production have approached the FAA and are also considering filing exemption requests: precision agriculture, power line and pipeline inspection, and oil and gas flare stack inspection. The companies are asking the agency to grant exemptions from regulations that address general flight rules, pilot certificate requirements, manuals, maintenance and equipment mandates. They are also asking for relief from airworthiness certification requirements as allowed under Section 333. Under that section of the law, certain airworthiness requirements can be waived to let specific UAS fly safely in narrowly defined, controlled, low-risk situations. To receive the exemptions, the firms must show that their UAS operations will not adversely affect safety, or provide at least an equal level of safety to the rules from which they seek the exemption. They would also need to show why granting the exemption would be in the public interest. Currently, Certificates of Waiver or Authorization are available to public entities that want to fly a UAS in civil airspace. Common uses today include law enforcement, firefighting, border patrol, disaster relief, search and rescue, military training, and other government operational missions. Commercial operations are authorized on a case-by-case basis. A commercial flight requires a certified aircraft, a licensed pilot and operating approval. The exemption process under Section 333 provides an additional avenue for commercial UAS operations. The film & TV production company petitions can be viewed online at <www.regulations.gov>.